Definition at line 730 of file llfolderview.h. Definition at line 733 of file llfolderview.h. Definition at line 899 of file llfolderview.h. Definition at line 2507 of file llfolderview.cpp. References LLView::addChild(), LLCallbackList::addFunction(), AUTO_OPEN_STACK_DEPTH, LLViewBorder::BEVEL_NONE, LLUICtrlFactory::buildMenu(), commitRename(), DB_INV_ITEM_NAME_STR_LEN, FALSE, gColors, LLControlGroup::getColor(), LLRectBase< Type >::getHeight(), LLRectBase< Type >::getWidth(), gIdleCallbacks, gUICtrlFactory, idle(), LEFT_INDENTATION, mAutoOpenCandidate, mAutoOpenItems, mAutoOpenTimer, LLRectBase< Type >::mBottom, LLFolderViewItem::mIndentation, LLFolderViewFolder::mIsOpen, mKeyboardSelection, LLFolderViewItem::mLabel, LLRectBase< Type >::mLeft, mPopupMenuHandle, LLView::mRect, mRenamer, LLView::mViewHandle, LLStringBase< char >::null, NULL, LLLineEditor::prevalidatePrintableNotPipe(), reshape(), LLMenuGL::setBackgroundColor(), LLLineEditor::setCommitOnFocusLost(), LLDepthStack< DATA_TYPE >::setDepth(), LLView::setRect(), LLUICtrl::setTabStop(), LLMenuGL::setVisible(), LLView::setVisible(), LLLineEditor::setWriteableBgColor(), LLFolderViewItem::sFont, LLFrameTimer::stop(), LLViewBorder::STYLE_LINE, TRUE, and LLColor4::white. Definition at line 2586 of file llfolderview.cpp. References clearSelection(), LLCallbackList::deleteFunction(), LLView::deleteViewByHandle(), gEditMenuHandler, gFocusMgr, gIdleCallbacks, gViewerWindow, LLViewerWindow::hasTopCtrl(), idle(), mAutoOpenItems, LLFolderViewFolder::mFolders, mItemMap, LLFolderViewFolder::mItems, mPopupMenuHandle, mRenameItem, mRenamer, mScrollContainer, NULL, LLFocusMgr::releaseFocusIfNeeded(), LLDepthStack< DATA_TYPE >::removeAllNodes(), and LLViewerWindow::setTopCtrl(). Definition at line 2672 of file llfolderview.cpp. References LLView::addChild(), LLFolderViewFolder::dirtyFilter(), FALSE, LLFolderViewItem::getListener(), LLFolderViewEventListener::getUUID(), LLRectBase< Type >::getWidth(), gInventoryLibraryRoot, LLFolderViewFolder::mFolders, LLView::mRect, LLFolderViewFolder::requestArrange(), LLView::reshape(), LLView::setOrigin(), LLView::setVisible(), and TRUE. Definition at line 4240 of file llfolderview.cpp. Referenced by LLFolderViewFolder::addToFolder(), and LLFolderViewItem::addToFolder(). Definition at line 2835 of file llfolderview.cpp. References FALSE, LLFolderViewItem::isSelected(), mSelectedItems, removeFromSelectionList(), LLFolderViewItem::setIsCurSelection(), and TRUE. Referenced by changeSelection(), extendSelection(), and setSelection(). Definition at line 2717 of file llfolderview.cpp. References LLFolderViewItem::arrange(), LLFolderViewFolder::arrange(), LLScrollableContainerView::calcVisibleSize(), LLFastTimer::FTM_ARRANGE, getArrangeGeneration(), getDebugFilters(), LLFolderViewItem::getFiltered(), LLRectBase< Type >::getHeight(), LLFontGL::getLineHeight(), LLInventoryFilter::getMinRequiredGeneration(), LLView::getRect(), LLFolderViewItem::getRoot(), getShowFolderState(), LLView::getVisible(), LLRectBase< Type >::getWidth(), LLFolderViewFolder::hasFilteredDescendants(), ICON_PAD, LEFT_PAD, llceil(), llmax(), llround(), mDebugFilters, mFilter, LLFolderViewFolder::mFolders, LLFolderViewItem::mHasVisibleChildren, LLFolderViewFolder::mItems, LLFolderViewFolder::mLastArrangeGeneration, mMinWidth, LLView::mRect, LLFolderViewItem::mRoot, mScrollContainer, LLFolderViewFolder::mTargetHeight, reshape(), LLView::reshape(), S32, LLView::setOrigin(), LLView::setVisible(), LLInventoryFilter::SHOW_ALL_FOLDERS, LLFolderViewItem::sSmallFont, and TRUE. Definition at line 774 of file llfolderview.h. Referenced by LLInventoryPanel::closeAllFolders(), doIdle(), LLInventoryPanel::openAllFolders(), removeSelectedItems(), and setSortOrder(). Definition at line 3435 of file llfolderview.cpp. References AUTO_OPEN_STACK_DEPTH, LLDepthStack< DATA_TYPE >::check(), FALSE, LLDepthStack< DATA_TYPE >::getDepth(), LLFolderViewItem::getParentFolder(), mAutoOpenItems, LLDepthStack< DATA_TYPE >::pop(), LLDepthStack< DATA_TYPE >::push(), LLFolderViewFolder::requestArrange(), scrollToShowItem(), LLFolderViewFolder::setOpen(), LLFolderViewFolder::setOpenArrangeRecursively(), and TRUE. Definition at line 3475 of file llfolderview.cpp. References autoOpenItem(), clamp_rescale(), f, FALSE, LLFrameTimer::getElapsedTimeF32(), LLFrameTimer::getStarted(), LLFolderViewFolder::isOpen(), mAutoOpenCandidate, mAutoOpenTimer, sAutoOpenTime, LLFolderViewFolder::setAutoOpenCountdown(), LLFrameTimer::start(), LLFrameTimer::stop(), and TRUE. Referenced by LLFolderViewFolder::handleDragAndDrop(), and LLFolderViewFolder::handleDragAndDropFromChild(). Definition at line 3505 of file llfolderview.cpp. References FALSE, LLView::getVisible(), LLView::mEnabled, mSelectedItems, and TRUE. Definition at line 3546 of file llfolderview.cpp. Definition at line 3943 of file llfolderview.cpp. References FALSE, mSelectedItems, and TRUE. Definition at line 2631 of file llfolderview.cpp. Definition at line 3556 of file llfolderview.cpp. References FALSE, LLView::getVisible(), LLFolderViewEventListener::isClipboardPasteable(), LLView::mEnabled, mSelectedItems, and TRUE. Definition at line 2922 of file llfolderview.cpp. References addToSelectionList(), LLFolderViewFolder::changeSelection(), clearSelection(), FALSE, mAllowMultiSelect, mSelectedItems, mSelectionChanged, removeFromSelectionList(), and TRUE. Referenced by LLFolderViewItem::changeSelectionFromRoot(), sanitizeSelection(), and LLPanelInventory::updateInventory(). Definition at line 2636 of file llfolderview.cpp. References mSortOrder, setSortOrder(), LLInventoryFilter::SO_DATE, and LLInventoryFilter::SO_FOLDERS_BY_NAME. Definition at line 3096 of file llfolderview.cpp. References FALSE, mSelectedItems, and LLFolderViewFolder::recursiveDeselect(). Referenced by changeSelection(), LLInventoryPanel::clearSelection(), deleteAllChildren(), setSelection(), and ~LLFolderView(). Definition at line 2692 of file llfolderview.cpp. References FALSE, LLFolderViewFolder::RECURSE_DOWN, and setOpenArrangeRecursively(). Definition at line 3459 of file llfolderview.cpp. References LLDepthStack< DATA_TYPE >::check(), f, FALSE, mAutoOpenCandidate, mAutoOpenItems, mAutoOpenTimer, NULL, LLDepthStack< DATA_TYPE >::pop(), LLFolderViewFolder::setAutoOpenCountdown(), LLFolderViewFolder::setOpen(), and LLFrameTimer::stop(). Definition at line 3139 of file llfolderview.cpp. Definition at line 3525 of file llfolderview.cpp. References LLFolderViewEventListener::copyToClipboard(), count, LLView::getVisible(), LLInventoryClipboard::instance(), LLView::mEnabled, mSearchString, mSelectedItems, NULL, LLInventoryClipboard::reset(), and S32. Definition at line 3551 of file llfolderview.cpp. Definition at line 4138 of file llfolderview.cpp. References clearSelection(), LLView::deleteAllChildren(), LLView::deleteViewByHandle(), gViewerWindow, LLViewerWindow::hasTopCtrl(), mPopupMenuHandle, mRenameItem, mRenamer, NULL, LLViewHandle::sDeadHandle, and LLViewerWindow::setTopCtrl(). Definition at line 3957 of file llfolderview.cpp. Definition at line 4269 of file llfolderview.cpp. References LLFolderViewFolder::applyFunctorRecursively(), arrangeAll(), LLFolderViewItem::arrangeFromRoot(), LLFocusMgr::childHasKeyboardFocus(), LLInventoryFilter::clearModified(), FALSE, filter(), LLFolderViewItem::filterFromRoot(), LLFastTimer::FTM_AUTO_SELECT, LLFastTimer::FTM_INVENTORY, LLControlGroup::getBOOL(), LLFolderViewFolder::getCompletedFilterGeneration(), LLInventoryFilter::getCurrentGeneration(), getDebugFilters(), LLFolderViewItem::getFiltered(), LLInventoryFilter::getMinRequiredGeneration(), LLFocusMgr::getMouseCapture(), gFocusMgr, gSavedSettings, LLView::isInVisibleChain(), LLInventoryFilter::isNotDefault(), mAutoSelectOverride, LLFolderViewFolder::mCompletedFilterGeneration, mDebugFilters, mFilter, mNeedsAutoSelect, mNeedsScroll, mSelectCallback, mSelectedItems, mSelectionChanged, mUserData, LLFolderViewFolder::needsArrange(), NULL, sanitizeSelection(), scrollToShowItem(), and scrollToShowSelection(). Definition at line 3148 of file llfolderview.cpp. References ACCEPT_YES_COPY_SINGLE, ACCEPT_YES_SINGLE, LLInventoryModel::backgroundFetchActive(), LLFontGL::BOTTOM, closeAutoOpenedFolders(), LLFolderViewFolder::draw(), f, FALSE, LLInventoryFilter::getCurrentGeneration(), LLFrameTimer::getElapsedTimeF32(), LLControlGroup::getF32(), LLRectBase< Type >::getHeight(), LLToolDragAndDrop::getLastAccept(), LLFontGL::getLineHeight(), LLInventoryFilter::getMinRequiredGeneration(), LLInventoryFilter::getMustPassGeneration(), getShowFolderState(), LLView::getVisible(), gInventory, gSavedSettings, gToolDragAndDrop, gViewerWindow, LLViewerWindow::hasKeyboardFocus(), LLTool::hasMouseCapture(), LLFolderViewItem::hasVisibleChildren(), LLFontGL::LEFT, llformat(), LLFolderViewFolder::mCompletedFilterGeneration, mDebugFilters, mDragAndDropThisFrame, mFilter, LLView::mRect, mSearchString, mSearchTimer, LLFolderViewItem::mStatusText, LLFontGL::NORMAL, NULL, LLFontGL::renderUTF8(), S32_MAX, LLViewerWindow::setKeyboardFocus(), setShowSingleSelection(), LLFolderViewItem::sFont, LLInventoryFilter::SHOW_ALL_FOLDERS, LLFolderViewItem::sSmallFont, LLFontGL::TOP, TRUE, and LLColor4::white. Definition at line 4350 of file llfolderview.cpp. References llendl, llinfos, and mSelectedItems. Definition at line 2964 of file llfolderview.cpp. References addToSelectionList(), LLDynamicArray< Type, BlockSize >::count(), LLFolderViewFolder::extendSelection(), FALSE, getCurSelectedItem(), i, mAllowMultiSelect, mSelectionChanged, S32, setSelection(), and TRUE. Definition at line 2809 of file llfolderview.cpp. References FALSE, LLFolderViewFolder::filter(), LLFastTimer::FTM_FILTER, LLFolderViewFolder::getCompletedFilterGeneration(), LLControlGroup::getS32(), gSavedSettings, llclamp(), LLFolderViewItem::mFiltered, and mMinWidth. Definition at line 3217 of file llfolderview.cpp. References FALSE, LLLineEditor::getText(), gViewerWindow, mRenameItem, mRenamer, NULL, LLFolderViewItem::rename(), scrollToShowSelection(), LLLineEditor::setCommitOnFocusLost(), LLLineEditor::setFocus(), LLFolderViewItem::setSelectionFromRoot(), LLViewerWindow::setTopCtrl(), LLView::setVisible(), and TRUE. Referenced by commitRename(), and handleKeyHere(). Definition at line 760 of file llfolderview.h. Definition at line 775 of file llfolderview.h. Referenced by arrange(), LLFolderViewFolder::arrange(), and LLFolderViewFolder::needsArrange(). Definition at line 2874 of file llfolderview.cpp. References llassert, mSelectedItems, and NULL. Referenced by extendSelection(), LLFloaterTexturePicker::handleKeyHere(), handleKeyHere(), LLFloaterLandmark::handleKeyHere(), handleUnicodeCharHere(), LLInventoryPanel::openSelected(), and sanitizeSelection(). Definition at line 884 of file llfolderview.h. Referenced by arrange(), doIdle(), and LLFolderViewItem::draw(). Definition at line 753 of file llfolderview.h. Referenced by LLFolderViewItem::draw(), LLInventoryPanel::getFilter(), LLFolderViewItem::getFiltered(), LLInventoryPanel::getShowFolderState(), LLInventoryPanel::getSinceLogoff(), LLFolderViewFolder::hasFilteredDescendants(), LLFloaterLandmark::LLFloaterLandmark(), LLFloaterNetwork2080::LLFloaterNetwork2080(), LLFloaterTexturePicker::LLFloaterTexturePicker(), LLFolderViewFolder::potentiallyVisible(), LLFolderViewItem::potentiallyVisible(), LLPanelInventory::reset(), LLInventoryPanel::setFilterPermMask(), LLInventoryPanel::setFilterSubString(), LLInventoryPanel::setFilterTypes(), LLInventoryPanel::setHoursAgo(), LLInventoryPanel::setShowFolderState(), LLInventoryPanel::setSinceLogoff(), and LLInventoryPanel::setSortOrder(). Definition at line 756 of file llfolderview.h. Definition at line 2804 of file llfolderview.cpp. 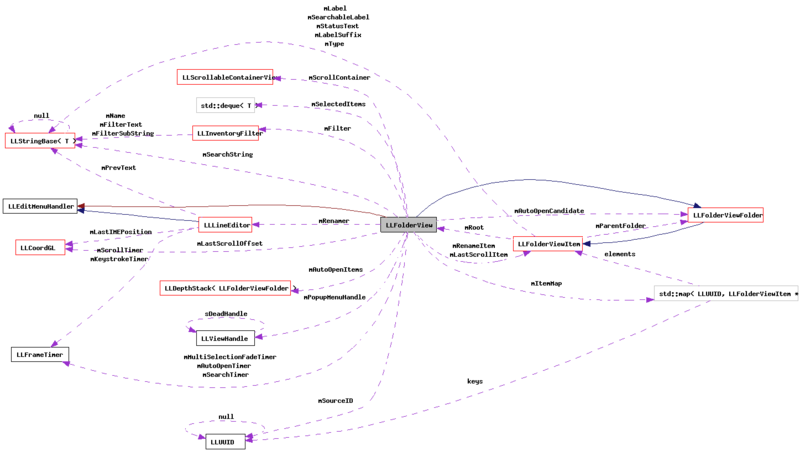 Referenced by LLFolderViewItem::draw(), and LLInventoryPanel::getFilterSubString(). Definition at line 755 of file llfolderview.h. Definition at line 4250 of file llfolderview.cpp. Referenced by LLFloaterNetwork2080::addNode(), LLInventoryPanel::buildNewViews(), doToSelected(), LLBeginIMSession::handleEvent(), LLFloaterTexturePicker::handleKeyHere(), LLFloaterLandmark::handleKeyHere(), LLInventoryPanel::modelChanged(), LLItemBridge::performAction(), LLInventoryPanel::rebuildViewsFor(), LLCallingCardBridge::refreshFolderViewItem(), LLFloaterNetwork2080::requestChildren(), sanitizeSelection(), LLInventoryPanel::setSelection(), and LLPanelInventory::updateInventory(). Definition at line 871 of file llfolderview.h. Definition at line 3105 of file llfolderview.cpp. Referenced by doToSelected(), LLAttachObject::handleEvent(), LLBeginIMSession::handleEvent(), and LLPanelInventory::updateInventory(). Definition at line 757 of file llfolderview.h. Referenced by arrange(), LLFolderViewFolder::arrange(), draw(), and sanitizeSelection(). Definition at line 4217 of file llfolderview.cpp. References FALSE, LLView::getViewByHandle(), LLView::getVisible(), mPopupMenuHandle, mShowSelectionContext, and TRUE. Definition at line 870 of file llfolderview.h. Definition at line 2667 of file llfolderview.cpp. Referenced by LLInventoryPanel::buildNewViews(), LLInventoryPanel::getSortOrder(), and LLInventoryPanel::~LLInventoryPanel(). Definition at line 4208 of file llfolderview.cpp. References LLRectBase< Type >::getHeight(), LLView::getRect(), LLRectBase< Type >::getWidth(), LLRectBase< Type >::mBottom, LLRectBase< Type >::mLeft, LLView::mRect, mScrollContainer, S32, and LLRectBase< Type >::setLeftTopAndSize(). Definition at line 2626 of file llfolderview.cpp. Definition at line 2621 of file llfolderview.cpp. Definition at line 4051 of file llfolderview.cpp. References FALSE, LLView::getVisible(), and LLView::handleDoubleClick(). Definition at line 4111 of file llfolderview.cpp. References LLView::handleDragAndDrop(), lldebugst, llendl, mDragAndDropThisFrame, and TRUE. Definition at line 4106 of file llfolderview.cpp. Definition at line 3677 of file llfolderview.cpp. References LLFolderViewItem::changeSelectionFromRoot(), LLFocusMgr::childHasKeyboardFocus(), LLViewerWindow::childHasKeyboardFocus(), FALSE, finishRenamingItem(), LLView::getChildCount(), LLView::getChildList(), getCurSelectedItem(), LLFolderViewItem::getNextOpenNode(), LLFolderViewItem::getParentFolder(), LLFolderViewItem::getPreviousOpenNode(), LLFolderViewItem::getRoot(), LLView::getViewByHandle(), LLView::getVisible(), gFocusMgr, LLScrollableContainerView::goToBottom(), LLScrollableContainerView::goToTop(), gViewerWindow, LLMenuGL::isOpen(), LLFolderViewItem::isSelected(), KEY_BACKSPACE, KEY_DOWN, KEY_END, KEY_ESCAPE, KEY_F2, KEY_HOME, KEY_LEFT, KEY_PAGE_DOWN, KEY_PAGE_UP, KEY_RETURN, KEY_RIGHT, KEY_UP, MASK_NONE, MASK_SHIFT, LLView::mEnabled, mKeyboardSelection, mPopupMenuHandle, mRenameItem, mRenamer, mScrollContainer, mSearchString, mSearchTimer, mSelectedItems, NULL, openSelectedItems(), LLScrollableContainerView::pageDown(), LLScrollableContainerView::pageUp(), LLFrameTimer::reset(), revertRenamingItem(), scrollToShowSelection(), search(), LLViewerWindow::setKeyboardFocus(), LLFolderViewItem::setOpen(), setSelection(), LLMenuGL::sMenuContainer, startRenamingSelectedItem(), and TRUE. Definition at line 3966 of file llfolderview.cpp. References FALSE, LLView::handleMouseDown(), mKeyboardSelection, mSearchString, setFocus(), and TRUE. Definition at line 4061 of file llfolderview.cpp. References LLMenuGL::arrange(), LLView::childrenHandleRightMouseDown(), count, FALSE, FIRST_SELECTED_ITEM, LLView::getChildList(), LLView::getViewByHandle(), LLView::getVisible(), list, mPopupMenuHandle, mSelectedItems, NULL, S32, setFocus(), setSelection(), LLMenuGL::setVisible(), LLMenuGL::showPopup(), LLMenuGL::sMenuContainer, TRUE, and LLMenuGL::updateParent(). Definition at line 4129 of file llfolderview.cpp. References FALSE, LLScrollableContainerView::handleScrollWheel(), and mScrollContainer. Definition at line 3908 of file llfolderview.cpp. References LLFocusMgr::childHasKeyboardFocus(), FALSE, getCurSelectedItem(), LLFrameTimer::getElapsedTimeF32(), LLControlGroup::getF32(), LLFolderViewItem::getRoot(), gFocusMgr, gSavedSettings, llendl, llwarns, mSearchString, mSearchTimer, LLFrameTimer::reset(), search(), and TRUE. Definition at line 4340 of file llfolderview.cpp. Referenced by LLFolderView(), and ~LLFolderView(). Definition at line 759 of file llfolderview.h. Referenced by LLInventoryView::onClose(), LLFloaterTexturePicker::onSearchEdit(), and LLFloaterLandmark::onSearchEdit(). Definition at line 881 of file llfolderview.h. Referenced by LLInventoryPanel::modelChanged(), and LLInventoryView::onSelectionChange(). Definition at line 880 of file llfolderview.h. Definition at line 3976 of file llfolderview.cpp. References gEditMenuHandler, NULL, and LLUICtrl::onFocusLost(). Definition at line 2698 of file llfolderview.cpp. References FALSE, LLView::getChildByName(), tut::inv(), setSelection(), and TRUE. Definition at line 3364 of file llfolderview.cpp. References LLFloaterView::getNewFloaterPosition(), LLView::getVisible(), gFloaterView, LLInventoryType::IT_ATTACHMENT, LLInventoryType::IT_OBJECT, left, LLView::mEnabled, mSelectedItems, NULL, LLMultiFloater::open(), LLMultiPreview::open(), S32, LLFloater::setFloaterHost(), and top. Referenced by handleKeyHere(), and open_selected_items(). Definition at line 3587 of file llfolderview.cpp. References LLFolderViewEventListener::getInventoryType(), LLView::getVisible(), LLInventoryType::IT_CATEGORY, LLView::mEnabled, mSearchString, and mSelectedItems. Definition at line 3404 of file llfolderview.cpp. References LLFloaterView::getNewFloaterPosition(), LLView::getVisible(), gFloaterView, left, LLView::mEnabled, mSelectedItems, NULL, LLMultiFloater::open(), S32, LLFloater::setFloaterHost(), and top. Definition at line 2849 of file llfolderview.cpp. Referenced by addToSelectionList(), changeSelection(), and LLFolderViewFolder::removeView(). Definition at line 4245 of file llfolderview.cpp. 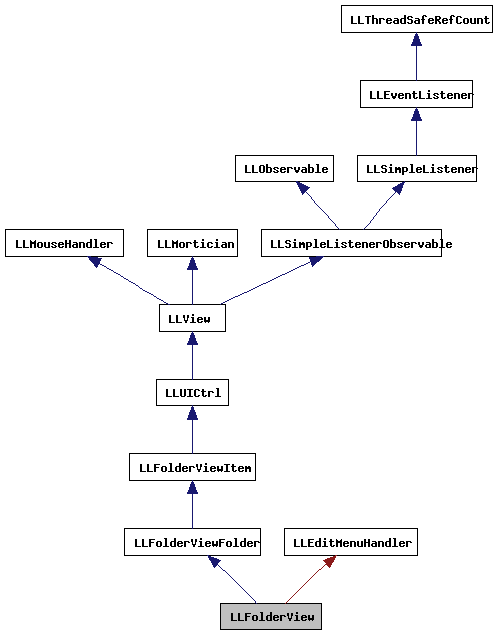 Referenced by LLFolderViewFolder::destroyView(), and LLFolderViewFolder::extractItem(). Definition at line 3259 of file llfolderview.cpp. References arrangeAll(), LLViewerWindow::childHasKeyboardFocus(), count, FALSE, LLDynamicArray< Type, BlockSize >::find(), LLDynamicArray< Type, BlockSize >::get(), LLFolderViewItem::getListener(), LLFolderViewItem::getName(), LLFolderViewItem::getNextOpenNode(), LLFolderViewItem::getParentFolder(), LLFolderViewItem::getPreviousOpenNode(), LLView::getVisible(), gViewerWindow, i, LLFolderViewItem::isOpen(), LLFolderViewItem::isRemovable(), LLFolderViewItem::isSelected(), llendl, llinfos, LLView::mEnabled, mRenameItem, mSelectedItems, NULL, LLDynamicArray< Type, BlockSize >::put(), LLFolderViewEventListener::removeBatch(), LLFolderViewFolder::removeItem(), S32, scrollToShowSelection(), and LLFolderViewItem::setSelectionFromRoot(). Referenced by delete_selected_item(), doDelete(), doToSelected(), and LLPanelInventory::removeSelectedItem(). Definition at line 2822 of file llfolderview.cpp. References LLScrollableContainerView::calcVisibleSize(), llmax(), mMinWidth, mScrollContainer, LLView::reshape(), and S32. Referenced by arrange(), and LLFolderView(). Definition at line 3244 of file llfolderview.cpp. References FALSE, gViewerWindow, mRenameItem, mRenamer, NULL, LLLineEditor::setCommitOnFocusLost(), LLLineEditor::setFocus(), LLFolderViewItem::setSelectionFromRoot(), LLViewerWindow::setTopCtrl(), LLView::setVisible(), and TRUE. Definition at line 2989 of file llfolderview.cpp. References changeSelection(), FALSE, gAgent, getCurSelectedItem(), LLAgent::getInventoryRootID(), getItemByID(), LLFolderViewItem::getParentFolder(), LLFolderViewItem::getRoot(), getShowFolderState(), LLFolderViewFolder::isOpen(), mSelectedItems, NULL, LLFolderViewFolder::potentiallyVisible(), setSelection(), LLInventoryFilter::SHOW_ALL_FOLDERS, and TRUE. Definition at line 4162 of file llfolderview.cpp. References LLFocusMgr::childHasKeyboardFocus(), LLFocusMgr::childHasMouseCapture(), FALSE, LLScrollableContainerView::getBorderWidth(), LLRectBase< Type >::getHeight(), LLFolderViewItem::getIndentation(), LLFontGL::getLineHeight(), LLView::getRect(), getVisibleRect(), LLRectBase< Type >::getWidth(), gFocusMgr, ICON_PAD, LLPointer< Type >::isNull(), llmax(), llmin(), llround(), LLView::localPointToOtherView(), LLRectBase< Type >::mBottom, LLFolderViewItem::mIcon, MIN_ITEM_WIDTH_VISIBLE, mLastScrollItem, mLastScrollOffset, LLRectBase< Type >::mLeft, mNeedsScroll, LLRectBase< Type >::mRight, mScrollContainer, LLRectBase< Type >::mTop, LLCoord::mX, LLCoord::mY, S32, LLScrollableContainerView::scrollToShowRect(), LLCoord::set(), and LLFolderViewItem::sFont. Referenced by autoOpenItem(), and doIdle(). Definition at line 4152 of file llfolderview.cpp. References mNeedsScroll, mSelectedItems, and TRUE. Referenced by LLFolderViewEventListener::arrangeAndSet(), LLSelectFirstFilteredItem::doFolder(), doIdle(), LLSelectFirstFilteredItem::doItem(), finishRenamingItem(), LLFloaterTexturePicker::handleKeyHere(), LLInventoryView::handleKeyHere(), handleKeyHere(), LLFloaterLandmark::handleKeyHere(), LLFloaterTexturePicker::onSearchEdit(), LLFloaterLandmark::onSearchEdit(), removeSelectedItems(), search(), LLInventoryPanel::setSortOrder(), and startRenamingSelectedItem(). Definition at line 3985 of file llfolderview.cpp. References FALSE, LLFolderViewFolder::getNextFromChild(), LLFolderViewItem::getNextOpenNode(), LLFolderViewFolder::getPreviousFromChild(), LLFolderViewItem::getPreviousOpenNode(), LLFolderViewItem::getSearchableLabel(), llmin(), NULL, S32, scrollToShowSelection(), setSelection(), LLStringBase< char >::toUpper(), and TRUE. Referenced by handleKeyHere(), handleUnicodeCharHere(), and LLInventoryView::incrementalFind(). Definition at line 751 of file llfolderview.h. Referenced by LLFloaterNetwork2080::LLFloaterNetwork2080(), and LLInventoryPanel::setAllowMultiSelect(). Definition at line 802 of file llfolderview.h. Definition at line 749 of file llfolderview.h. Definition at line 3664 of file llfolderview.cpp. References gEditMenuHandler, LLUICtrl::hasFocus(), and LLUICtrl::setFocus(). Referenced by LLFloaterTexturePicker::handleKeyHere(), LLInventoryView::handleKeyHere(), LLFloaterLandmark::handleKeyHere(), handleMouseDown(), handleRightMouseDown(), and setSelection(). Definition at line 882 of file llfolderview.h. Referenced by do_create(), and LLInventoryView::onSelectionChange(). Definition at line 2708 of file llfolderview.cpp. References LLFolderViewFolder::mIsOpen, LLFolderViewFolder::setOpenArrangeRecursively(), and TRUE. Referenced by LLInventoryPanel::closeAllFolders(), closeAllFolders(), and LLInventoryPanel::openAllFolders(). Definition at line 863 of file llfolderview.h. Referenced by LLFloaterNetwork2080::LLFloaterNetwork2080(), and LLPanelInventory::reset(). Definition at line 750 of file llfolderview.h. Referenced by LLFloaterNetwork2080::LLFloaterNetwork2080(), and LLInventoryPanel::setSelectCallback(). Definition at line 2887 of file llfolderview.cpp. References addToSelectionList(), clearSelection(), FALSE, LLFolderViewItem::getParentFolder(), llassert, mSelectedItems, mSelectionChanged, LLFolderViewFolder::requestArrange(), setFocus(), LLFolderViewFolder::setSelection(), and TRUE. Referenced by LLSelectFirstFilteredItem::doFolder(), LLSelectFirstFilteredItem::doItem(), extendSelection(), LLFloaterTexturePicker::handleKeyHere(), handleKeyHere(), LLFloaterLandmark::handleKeyHere(), handleRightMouseDown(), openFolder(), sanitizeSelection(), search(), LLFolderViewItem::setSelectionFromRoot(), LLInventoryPanel::unSelectAll(), and LLPanelInventory::updateInventory(). Definition at line 867 of file llfolderview.h. Referenced by LLFolderViewItem::handleHover(), and LLFolderViewItem::handleMouseUp(). Definition at line 4231 of file llfolderview.cpp. References mMultiSelectionFadeTimer, mShowSingleSelection, and LLFrameTimer::reset(). Definition at line 2648 of file llfolderview.cpp. References arrangeAll(), LLFastTimer::FTM_SORT, LLFolderViewFolder::mFolders, mSortOrder, and t.
Referenced by checkTreeResortForModelChanged(), LLFloaterNetwork2080::LLFloaterNetwork2080(), and LLInventoryPanel::setSortOrder(). Definition at line 3116 of file llfolderview.cpp. References LLToolDragAndDrop::beginMultiDrag(), DAD_NONE, gToolDragAndDrop, mSelectedItems, mSourceID, LLUUID::null, TRUE, and type. Definition at line 3620 of file llfolderview.cpp. References ARROW_SIZE, LLScrollableContainerView::calcVisibleSize(), count, LLRectBase< Type >::getHeight(), LLFolderViewItem::getIndentation(), LLFontGL::getLineHeight(), LLFolderViewItem::getListener(), LLFolderViewItem::getName(), LLView::getRect(), LLView::getVisible(), LLRectBase< Type >::getWidth(), LLViewerWindow::getWindowWidth(), gViewerWindow, height, ICON_PAD, ICON_WIDTH, LLFolderViewEventListener::isItemRenameable(), llfloor(), llmax(), llmin(), LLView::localPointToScreen(), LLView::mEnabled, MINIMUM_RENAMER_WIDTH, LLRectBase< Type >::mLeft, LLView::mRect, mRenameItem, mRenamer, mScrollContainer, mSelectedItems, NULL, RENAME_HEIGHT_PAD, renamer_focus_lost(), LLLineEditor::reshape(), S32, LLView::screenPointToLocal(), scrollToShowSelection(), LLLineEditor::selectAll(), LLLineEditor::setFocus(), LLUICtrl::setFocusLostCallback(), LLView::setOrigin(), LLLineEditor::setText(), LLViewerWindow::setTopCtrl(), LLView::setVisible(), LLFolderViewItem::sFont, TEXT_PAD, TRUE, width, x, and y.
Referenced by doToSelected(), handleKeyHere(), LLInventoryView::onSelectionChange(), and LLPanelInventory::startRenamingSelectedItem(). Definition at line 766 of file llfolderview.h. Definition at line 902 of file llfolderview.h. Referenced by changeSelection(), extendSelection(), getAllowMultiSelect(), and setAllowMultiSelect(). Definition at line 928 of file llfolderview.h. Referenced by arrangeAll(), and getArrangeGeneration(). Definition at line 920 of file llfolderview.h. Referenced by autoOpenTest(), closeAutoOpenedFolders(), and LLFolderView(). Definition at line 919 of file llfolderview.h. Referenced by autoOpenItem(), closeAutoOpenedFolders(), LLFolderView(), and ~LLFolderView(). Definition at line 921 of file llfolderview.h. Definition at line 914 of file llfolderview.h. Referenced by doIdle(), and needsAutoSelect(). Definition at line 917 of file llfolderview.h. Referenced by arrange(), doIdle(), draw(), and getDebugFilters(). Definition at line 935 of file llfolderview.h. Referenced by draw(), handleDragAndDrop(), and setDragAndDropThisFrame(). Definition at line 924 of file llfolderview.h. Referenced by arrange(), doIdle(), draw(), getFilter(), getFilterPermissions(), getFilterSubString(), getFilterTypes(), getShowFolderState(), isFilterModified(), and setFilterPermMask(). Definition at line 934 of file llfolderview.h. Referenced by addItemID(), getItemByID(), removeItemID(), and ~LLFolderView(). Definition at line 901 of file llfolderview.h. Referenced by handleKeyHere(), handleMouseDown(), and LLFolderView(). Definition at line 911 of file llfolderview.h. Definition at line 912 of file llfolderview.h. Definition at line 933 of file llfolderview.h. Referenced by arrange(), filter(), and reshape(). Definition at line 927 of file llfolderview.h. Referenced by getSelectionFadeElapsedTime(), and setShowSingleSelection(). Definition at line 915 of file llfolderview.h. Referenced by needsAutoRename(), and setNeedsAutoRename(). Definition at line 913 of file llfolderview.h. Definition at line 910 of file llfolderview.h. Referenced by doIdle(), scrollToShowItem(), and scrollToShowSelection(). Definition at line 897 of file llfolderview.h. Referenced by deleteAllChildren(), getShowSelectionContext(), handleKeyHere(), handleRightMouseDown(), LLFolderView(), and ~LLFolderView(). Definition at line 907 of file llfolderview.h. Referenced by deleteAllChildren(), finishRenamingItem(), handleKeyHere(), removeSelectedItems(), revertRenamingItem(), startRenamingSelectedItem(), and ~LLFolderView(). Definition at line 908 of file llfolderview.h. Referenced by deleteAllChildren(), finishRenamingItem(), handleKeyHere(), LLFolderView(), revertRenamingItem(), startRenamingSelectedItem(), and ~LLFolderView(). Definition at line 890 of file llfolderview.h. Referenced by arrange(), getVisibleRect(), handleKeyHere(), handleScrollWheel(), reshape(), scrollToShowItem(), setScrollContainer(), startRenamingSelectedItem(), and ~LLFolderView(). Definition at line 923 of file llfolderview.h. Referenced by copy(), draw(), handleKeyHere(), handleMouseDown(), handleUnicodeCharHere(), and paste(). Definition at line 922 of file llfolderview.h. Referenced by draw(), handleKeyHere(), and handleUnicodeCharHere(). Definition at line 931 of file llfolderview.h. Referenced by doIdle(), and setSelectCallback(). Definition at line 900 of file llfolderview.h. Referenced by addToSelectionList(), canCopy(), canDoDelete(), canPaste(), changeSelection(), clearSelection(), copy(), doDelete(), doIdle(), dumpSelectionInformation(), getCurSelectedItem(), getSelectionList(), handleKeyHere(), handleRightMouseDown(), openSelectedItems(), paste(), propertiesSelectedItems(), removeFromSelectionList(), removeSelectedItems(), sanitizeSelection(), scrollToShowSelection(), setSelection(), startDrag(), and startRenamingSelectedItem(). Definition at line 932 of file llfolderview.h. Referenced by changeSelection(), doIdle(), extendSelection(), and setSelection(). Definition at line 903 of file llfolderview.h. Definition at line 925 of file llfolderview.h. Referenced by getShowSelectionContext(), and setShowSelectionContext(). Definition at line 926 of file llfolderview.h. Referenced by getShowSingleSelection(), and setShowSingleSelection(). Definition at line 918 of file llfolderview.h. Referenced by checkTreeResortForModelChanged(), getSortOrder(), and setSortOrder(). Definition at line 904 of file llfolderview.h. Definition at line 930 of file llfolderview.h. Definition at line 735 of file llfolderview.h. Referenced by autoOpenTest(), and saved_settings_to_globals().